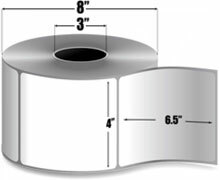 Intermec Duratherm II Tag - 4" x 6.5" Direct thermal paper tag. 923 tags/roll, 8 roll case. Also available as a roll (Part# E04204-R). The Intermec E04204 is also known as Intermec Technologies	IMP-E04204	.